Smoothies have become phenomenally popular over the past fear years and are now dominating the majority of the beverage market. The popularity and growth in the smoothie market has been driven by customers who are focusing on living healthier lifestyles and picking the healthier alternative of their favourite food and beverages. With customers enjoying the taste and convenience of smoothies the market is expected to continue to grow in the coming years according to Research & Markets. According to Natural News, smoothie sales have risen up 80% since 2002 and a large part of the Smoothie popularity is the image of being a healthy substitute for carbonated drinks. The popularity surrounding smoothies has seen the number of smoothie retailers grown dramatically, with more than 4,000 locations across America alone. To keep up momentum smoothie retailers are continuously introducing new flavours and recipes to keep the demand for smoothies on top. The Independent UK, reports that in 2006 34million litres of smoothie was consumed, compared to the 6.3litres that were recorded in 2001. This growth came at a time when people are becoming more and more concerned with their diets and are turning away from processed food and carbonated drinks. As a result of tremendous growth, many food chains, quick service restaurants and beverage companies are entering the smoothie segment by opening their own independent smoothie shops. The growth interest of large beverage companies entering the smoothie market is driven by the declining sales of soft drink in the United States according to Research and Markets. With fitness, nutrition and health becoming the priority in the majority of peoples lives, smoothies and the healthy image associated with them are becoming the ‘go-to’ for people who crave nutrition but are not fond of eating fruits, vegetables or salads. Smoothies are seen as a pleasant health treat and with functional foods and beverages having a strong marketplace advantages, smoothies are dominating the healthy beverage category. Not only are smoothies attractive to those seeking a healthy lifestyle, smoothies also appeal to the customers with busy lifestyles. Smoothies are simple to make and people don’t have the time to create a five star healthy meal. • People who exercise find that a smoothie will give them more energy and those into strength training find it fulfils their protein requirements. 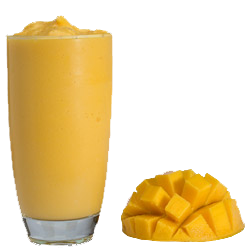 • A sweet smoothie can be enjoyed as a dessert. 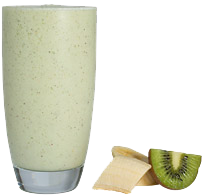 • A green/vegetable based smoothie can serve as your daily dose of vegetables. Full of nutrients, smoothies have become a meal replacement options and a great way for people to keep their weight in check. 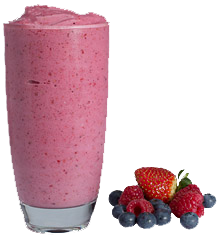 The fruits and vegetables frequently used in smoothies titillate the taste buds and make people feel full. To replace breakfast a smoothie should be full of protein and complex carbohydrates and a dinner smoothie should be high on protein but low on carbs. With the continued emphasis on healthy eating and improving eating habits, the smoothie trend will continue to grow in years to come.